HOUSTON – (Aug. 15, 2018) – Oil and water tend to separate, but they mix well enough to form stable oil-in-water emulsions in produced water from oil reservoirs to become a problem. 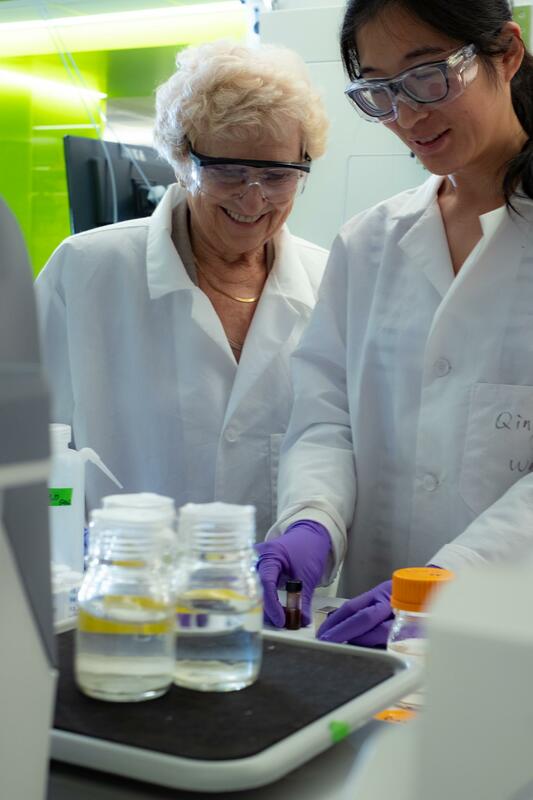 Rice University scientists have developed a nanoparticle-based solution that reliably removes more than 99 percent of the emulsified oil that remains after other processing is done. The Rice lab of chemical engineer Sibani Lisa Biswal made a magnetic nanoparticle compound that efficiently separates crude oil droplets from produced water that have proven difficult to remove with current methods. The research is detailed in a paper in the Royal Society of Chemistry journal Environmental Science: Water Research & Technology. Produced water comes from production wells along with oil. It often includes chemicals and surfactants pumped into a reservoir to push oil to the surface from tiny pores or cracks, either natural or fractured, deep underground. Under pressure and the presence of soapy surfactants, some of the oil and water form stable emulsions that cling together all the way back to the surface. While methods exist to separate most of the oil from the production flow, engineers at Shell Global Solutions, which sponsored the project, told Biswal and her team that the last 5 percent of oil tends to remain stubbornly emulsified with little chance to be recovered. "Injected chemicals and natural surfactants in crude oil can oftentimes chemically stabilize the oil-water interface, leading to small droplets of oil in water which are challenging to break up," said Biswal, an associate professor of chemical and biomolecular engineering and of materials science and nanoengineering. The Rice lab's experience with magnetic particles and expertise in amines, courtesy of former postdoctoral researcher and lead author Qing Wang, led it to combine techniques. The researchers added amines to magnetic iron nanoparticles. Amines carry a positive charge that helps the nanoparticles find negatively charged oil droplets. Once they do, the nanoparticles bind the oil. Magnets are then able to pull the droplets and nanoparticles out of the solution. "It's often hard to design nanoparticles that don't simply aggregate in the high salinities that are typically found in reservoir fluids, but these are quite stable in the produced water," Biswal said. The enhanced nanoparticles were tested on emulsions made in the lab with model oil as well as crude oil. In both cases, researchers inserted nanoparticles into the emulsions, which they simply shook by hand and machine to break the oil-water bonds and create oil-nanoparticle bonds within minutes. Some of the oil floated to the top, while placing the test tube on a magnet pulled the infused nanotubes to the bottom, leaving clear water in between. Best of all, Biswal said, the nanoparticles can be washed with a solvent and reused while the oil can be recovered. The researchers detailed six successful charge-discharge cycles of their compound and suspect it will remain effective for many more. She said her lab is designing a flow-through reactor to process produced water in bulk and automatically recycle the nanoparticles. That would be valuable for industry and for sites like offshore oil rigs, where treated water could be returned to the ocean. Co-authors of the paper are Rice research scientist Maura Puerto, Rice alumnus Sumedh Warudkar of Shell Oil Products and Jack Buehler, principle consultant at Shell Global Solutions.